Charlie Poole was born in Randolph County, North Carolina on March 22, 1892. He learned to play the banjo in his youth and also played baseball. It is rumored that his three-finger playing style, a version of classical banjo, is due to a baseball injury. He spent most of his life working in a textiles mill, and playing music on the side. 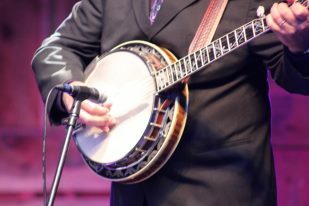 During his off time from the mill, he would travel from town to town across the country playing his banjo. In 1918, he settled in Spray, NC and married two years later. He soon teamed up with his brother-in-law, fiddler Posey Rorer, playing with other local musicians. They joined up with guitarist Norm Woodlieff and created The North Carolina Ramblers. In 1925, the trio auditioned for Columbia Records in New York and were accepted. They cut four very successful songs, including, “Don’t Let Your Deal Go Down”, which became a country and bluegrass standard. Poole sang in a plain, simple way that complimented his banjo picking style. The North Carolina Ramblers sang songs that were a mix of minstrel, victorian ballads, and humorous burlesques. Some of their most popular songs were “Sweet Sunny South” and “White House Blues”. Throughout the 1920s, The Ramblers recorded close to 70 sides for Columbia Records. With fame, came a fast-paced life filled of drinking for Poole who became very reckless and rowdy. He was one of the first country artists to gain widespread popularity through recordings. In 1930, his self-confidence began to fade along with his popularity and he took to drinking even more. Due to his reckless lifestyle, he passed away in 1931because of heart failure the following year. He was scheduled to perform in a film that year and passed before he could make it to Hollywood. Rorer, who had left the band in 1929 and guitarist, Roy Harvey began leading the North Carolina Ramblers. They continued to record and perform for several years. During the folk revival of the 1960s, Poole’s music became popular again. His complete recordings were released on CD by the County Label in the 1990s and he later received the full Columbia legacy treatment in 2005 by having the three-disc-box-set, You Ain’t Talkin’ to Me: Charlie Poole and The Roots of Country Music released.